When first walking into a beautifully constructed multi-level home, sometimes the first thing you see is the staircase. Now, what if that staircase was boring or didn’t quite match the rest of the homes’ modern aesthetic? Robby of Freehold, New Jersey ran into this issue with his staircase and decided to do something about it. He loved the modern look of stainless steel and wanted to find out if he could incorporate that into his home, without sacrificing safety. 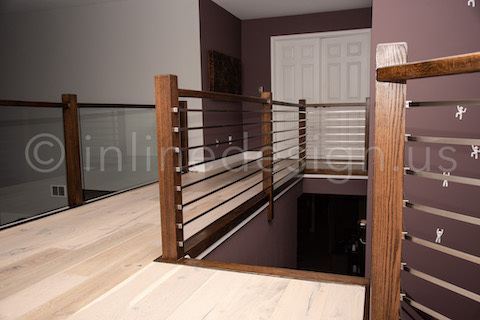 With the help of his loved ones, Robby was made aware of several companies offering staircase railing systems, but not many offered the excellent customer service and professionalism like that of Inline Design. 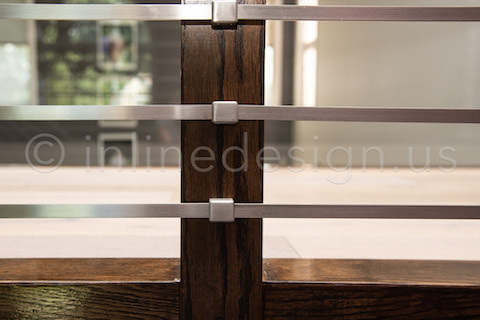 Around the beginning of May, Robby decided to take his inquiry seriously and started browsing the Inline Design website for custom staircase railing options. He was pleasantly surprised at the several different types of railing systems that he could choose from – all offering safety measures, corrosion resistance and durability. The modern aesthetic he was looking for wasn’t as hard to come by as he thought, the stainless steel railing systems he’d come to love weren’t just for doctors’ offices and restaurants. Robby called Inline Design a few times to ask questions about the stainless steel products, and then decided on which steel bar and bar holder would be best for his current staircase set-up. On May 31st, Robby placed his official order for several of our beautifully constructed Stainless Steel Bars and matching Stainless Steel Bar Holders to bring life into the entrance of his home! 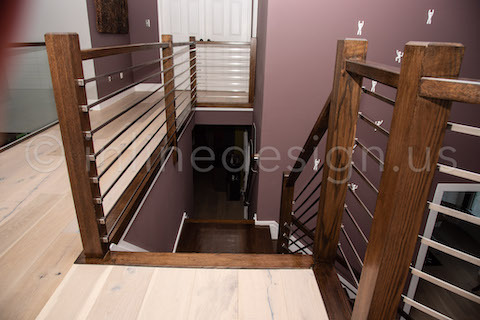 These 9/16” x 3/16” stainless steel bars and their holders could elevate the level of elegance of any room, but they were really going to bring out the rich maroon in Robby’s wall paint and smooth chocolate of the wooden stairs. After Robby received his product, he reached out to Inline Design for some assistance as he was a little unsure with the installation process – could he install his brand-new bars and holders himself or was he going to have to hire a contractor to install them for him? After speaking to one of our experienced and dedicated sales reps, Robby felt extremely confident in his own ability to install his materials himself, and he knew he had an ally in Inline Design if he had any further questions or concerns. He was even made aware of a rebate that was available for the product he purchased. 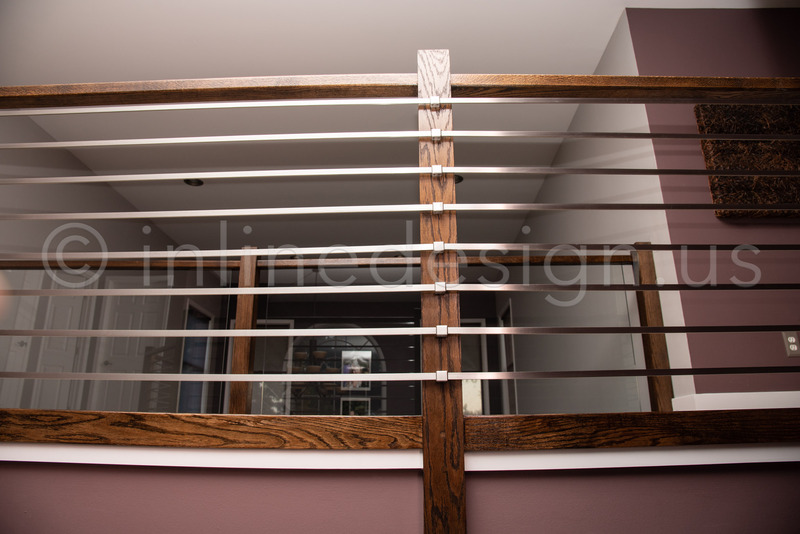 The Inline Design sales rep told Robby that once his new railing system was installed, he should take photos of the completed project and Inline Design would take it from there! In July, Robby successfully installed his railing system and by September, he reached out via email with photos of the completed project, and some praise for Inline Design with how great the entrance of his home looks. He mentioned how the first thing his guests mention is the astounding staircase and how the mixed-material entrance really offers a genuine moment of awe! We were so happy to help bring a cohesive look to Robby’s home and offer his guests a unique experience! We made sure to equip Robby with a great resource on how to continuously maintain his stainless steel surfaces, so he will know just what to do to keep his newly installed stair railing in tip-top shape for several years to come!